The Pitt swimming and diving team said goodbye to some of its most accomplished female divers in program history at the NCAA Women’s Swimming & Diving Championships in Columbus, Ohio, this past weekend. The Panthers had four athletes compete across seven events, with two earning top-25 finishes. It was first trip to the championships for first-year diver Lydia Rosenthall, while seniors Lina Rathsack, Amanda Richey and Meme Sharp all made their third and final trips. Richey and Rathsack both failed to advance on the first day of qualifiers. Like last year, Richey finished 29th in the 500-yard freestyle with a time of 4:41.41. Rathsack took 62nd in the 200-yard individual medley with a time of 2:01.44. Katie Ledecky from Stanford — who became an international star at the 2016 Summer Olympics in Rio de Janeiro — won the 500-yard freestyle prelims and finals. Her time in the prelim was 4:29.73, and in the final was 4:26.57. Junior Ella Eastin from Stanford set an NCAA record in the 200-yard individual medley final with a time of 1:50.67. Her time in the prelim was 1:53.74, just 0.26 seconds off of the leader. Rathsack swam the 200-yard breaststroke prelim with a time of 1:00.17 — good enough for 23rd place in the competition. This is the second top-25 finish of her career. Her other top-25 finish came at last year’s NCAAs when she finished 13th in the 100-meter breaststroke. The leader, Olympian Lilly King from Indiana, had a time of 57.35 in the prelim and an NCAA-record time of 56.25 in the final. Rathsack finished 38th in the 200-yard breaststroke with a prelim time of 2:11.56. This was also the final swim of her Pitt career. King also won this event with a prelim time of 2:05.49, and a final time of 2:02.60. 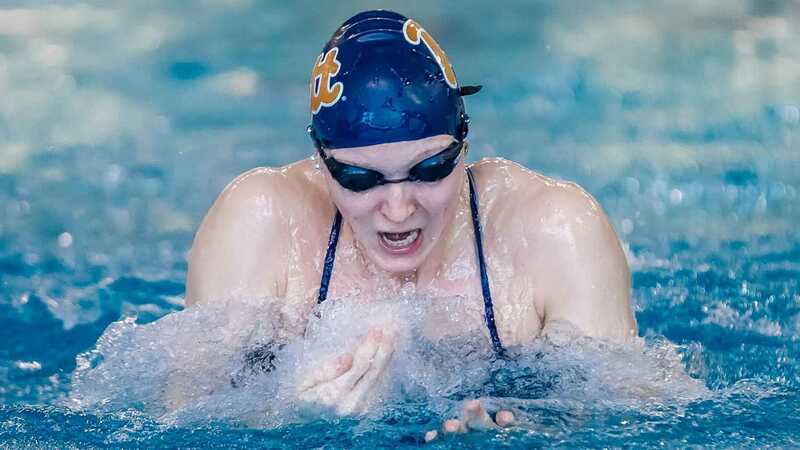 In the final swim of her Pitt athletic career, Richey finished 20th in the 1,650-yard freestyle — her best finish with one of her top times, 16:06.24. It was Ledecky who also claimed this event with a time of 15:07.57. Both Sharp and Rosenthall competed in the 1-meter springboard competition. Rosenthall placed 33rd with a score of 262.85 after six dives in the 1-meter springboard in her NCAA championships debut, while Sharp took 45th in the 1-meter with a score of 248.50. She was 91.25 points behind leader Sarah Bacon, a sophomore from Minnesota. Bacon went on to win the final with a score of 343.50. Rosenthall’s final event was the 3-meter springboard. She placed 45th with a 240.35 following her six-dive set, and was 144.25 off of the prelim leader. Sharp, Rathsack and Richey all capped off their illustrious careers on Saturday. Sharp finished her distinguished career a three-time NCAA qualifier, an ACC individual champion, an All-American and as Pitt’s school-record holder in all three diving disciplines. Richey holds two top-30 finishes and school records in the 500-yard freestyle, 1,650-yard freestyle and 400-yard individual medley. Rathsack qualified for the NCAA Championships in three events in three consecutive seasons and ended her career with top-25 finish.